Property #53787 - I really like having a pool when you step outside. The beds are comfy pillows and beds. They have it stocked when you come in like pots, pans, some spices and more. I would give it 5 out of 5 stars. Property #53787 - Our first impressions of your home was: Wow! All the decorating touches made us feel like a home with love. Your wall ‘comforters’ are breath taking! How I appreciate another’s art. We loved having a pool close by, the outdoor space to read, meditate and simply enjoy the view. Our room had a very comfortable bed which allowed us a great sleep. Thank you for sharing your home away from home with us. Property #53787 - This clean, spacious unit is conveniently located right next to the largest pool of 4 pools. The on-site restaurant is convenient and you are also only a few steps to the beach. The staff at the gate were always happy to call us a 43 peso taxi and we never waited more than a few minutes. The property manager, Erin, was so great to deal with. She always responded quickly to my emails and was happy to help us with tours. We thoroughly enjoyed our week at Cosmo. I would highly recommend choosing a condo over an all inclusive. Property #53787 - When we arrived to our condo at Cosmo we were met by Erin who was extremely helpful and accommodating. The condo was beautiful and exactly as described and had everything we needed. The beds were extremely comfortable and we were virtually steps from the pool and a had a lovely view of the ocean. The beach was a 2-minute walk from the unit. The on-site restaurant had excellent food and the strawberry margaritas were great. Property #38163 - Very nice condo property with views of the ocean from the balcony. Immaculately kept grounds and great location in gated property only minutes from town. Erin (Bayside Vacation Rentals) was only an email away and was very helpful from booking excursions to advice on restaurants. Property #40263 - The condo was spacious, clean and the small touches were welcoming! There was everything needed to make our home away from home wonderful. Property #33483 - Loved the location, could walk everywhere or very easy to get a taxi! Property #38163 - Bayside Vacation Rental introduced us to a wonderful place to relax and immerse ourselves in the very friendly Mexican culture in Huatulco. Thank you Erin for your wealth of information and tips on the area - we are already planning the next trip back this winter to enjoy more of this Mexican gem! Property #40263 - If you are looking for a slice of paradise with spectacular ocean views, this is where you want to stay! Cruz del Mar has the best ocean views in Huatulco. 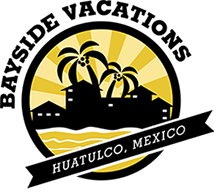 It was centrally located, we could walk down the hill to take advantage of everything Huatulco has to offer, restaurants, shops, markets, grocery stores and the amazing beaches. Can't wait to head back next Winter. Property #53924 - What a beautiful resort development. We loved our condo! It was equipped with everything we needed. The direct beach access to Playa Arrocito and the on-site amenities at the development were so convenient. We took advantage of the grocery concierge service with Bayside Real Estate. We loved having our fridge stocked when we arrived. Can't wait to come back! Property #53322 - Oceanside at Cruz del Mar - This condo was fully equipped with everything you need and was centrally located. The pictures don't do justice. Erin was very professional. She provided us a list of places to eat, shop and the beaches to visit. Huatulco is very serene and beautiful. Hope to be back soon. Viewpoint #3667 - We were both very impressed with how quiet & clean the complex was & most importantly, the endless views.